Note that this article was originally written in 1968 by Mrs P Reeks. For Current Information try the website at "www.dorsetbuttons.co.uk". Quite by chance one day, it was discovered that a village resident, Mrs. Horwood, was not only a keen needle woman and an authority on Dorset Feather Stitchery, but is doing her utmost to revive buttony and lace-making. Mrs Horwood is a Dane who has spent many years in India and came to live in Verwood in 1950. She travels through many parts of England exhibiting work and demonstrating how it is achieved. Much of her time is spent working with the Dorset Women's Institutes reviving "lost" crafts. She was therefore delighted to teach a "member of the next generation" how to work Dorset Feather Stitchery and Dorset Buttons. 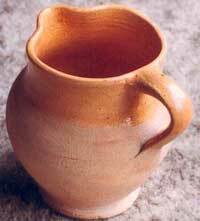 As my interest in the work deepened, I felt that I had to know how these crafts originated. Apparently they were first made in Shaftesbury at the close of the seventeenth century by Abraham Case, those first buttons being called "high tops" and "knobs". They were made on a disc of horn from the Dorset Horned Sheep. The disc was covered with a piece of linen, which was then worked all over with fine linen thread to form a conical or knob shape depending on the type of button required. The high-tops were worn by gentlemen on their hunting waistcoats. From these small beginnings in Shaftesbury, buttony became a village industry in Dorset at the beginning of the eighteenth century, emplying thousands of people and bringing in a revenue of twelve thousand pounds per annum. Buttons were in great demand in Europe and America as well as in this country and they were exported from Liverpool. The wire-ring buttons were invented by Abraham Case's grandson in the reign of George II. The wire was brought to the area from Birmingham by Horse and Waggon in one and a half ton loads. It was made into button rings by being twisted on a spindle and the cut ends being dipped in solder. Children were employed as "stringers". They threaded the rings into gross bundles, whilst others were at one time employed to polish the finished buttons until it was found that this damaged the thread, when this procedure then ceased. By the beginning of the nineteenth century the Cases had depots for the cottage workers all over Dorset , the east Dorset depots being Blandford, Bere Regis, Lychett Minster, Iwerne Minster and Langton Matravers. Buttons called "Blandford Cartwheels" were mainly made in the Blandford area, which until the beginning of the seventeenth century had been a centre for the Huguenot lace-makers, Whcn lace lost its popularity, the fine lace thread was used to make buttons. Linen shirt buttons were also made at Blandford. I was intrigued when I discovered that there had been Huguenots in Bland-- ford at that period, as within three miles of Verwood at Woodlands there is a building called, "The Round House", reputedly a Huguenot building. There are varying tales of its original use, some think that it was used by weavers, others think that spinners and lace makers worked there. |I am beginning to think that the latter is possible as flax and hemp were grown in the east Dorset area in Saxon times. In east Dorset varying types of buttons were made including High tops and Knobs, as previously mentioned and also those worked on a sire ring. These latter were Blandford Cartwheels, Yarrels with ten spokes, Basket-weave, Honeycomb with an odd number of spokes, Crosswheel of spider web, Singleton made from a linen covered padded ring, Jaml or Gem, Bird's eye a padded ring with a hols in the centre, Mites and Spangles, These last two types were very tiny and some buttons were decorated with beadwork. . Examples of Dorset Buttons can be seen in the Dorset County, Christchurch, Poole, Shaftesbury and Victoria and Albert Museums. I was extremely fortunate in being able to purchase a few buttons from an enthusiast at the Dorset Art and Craft Exhibition last summer and feel proud to own part of Dorset's History. These I have included to illustrate as many as possible of the types mentioned above. The complete buttons mere mounted on cards for sale. The first quality for export, were mounted on pink cards, the seconds on dark blue cards and the third quality were mounted on yellow cards, these last two qualities being for sale in England. Any dirty buttons were boiled in a linen bag before being mounted. It is said that expert buttoners could make up to one gross a day for which they were paid three shillings and six pence or three shilling and nine pence if the buttons were perfect. The out workers many on foot, took their buttons for sail to the various depots on certain days called "Button Days". Apparently they were not always paid in cash but sometimes in good. A bitter blow struck the buttoners in 1850 when Ashton's patent button machine was exhibited at the Great London Exhibition. in 1851 the cottage industry was at an end bringing poverty and starvation to the families of the buttoners. It is said that as the result of this some three hundred and fifty families from Shaftesbury alone were shipped to the colonies at the Government's expense, some to Canada and others to Australia . The Dowager Lady Lees fought to revive the industry in Lychett Minster at the beginning of this century. She succeeded in building up a small business which in 1908 produced parliamentary buttons; pale blue for the South Dorset Conservatives and purple for the East Dorset Conservatives. The advent of the 1914 to 1918 war brought this revival to an end. In 1967 boxes of buttons were found in an old cottage on Lady Lees' estate. Most of these she sold to Americans to raise funds for her Religious films projects, hut sadly she died a few months before she was able to complete the recent project. The secret of making high-tops and knobs has never been solved, but the buttons made on wire rings are the types which are being revived. To make one of these buttons, the ring is held in the left hand and "casting" done by button-holing closely all round the ring, sewing over the loose end at the beginning. The button-holed ridge is then turned inside by pushing with the thumb, this was dune originally with a boned instrument called a "slicker" until it was found that this weakened the threads. When "laying" the spokes of the wheel, the thread must be kept taut to hold the spokes in place, these are secured by a cross-stitch at the hub centre. The button can then be ''rounded" in many designs e.g. cross-wheel; basket weave etc., I have been told that it is useful to leave one or two threads at the button back with which to sew the button onto the garment. Dorset feather stitchery, is believed to have been "borrowed" from the Welsh in the seventeenth Century. It was worked on smock-frocks ( the usual outer garment of the country labourers and craftsmen. These smocks were worn by them over ordinary working clothes with coloured neckerchief at their necks. They were made of strong coarse linen and were embroidered on the collar, shoulders and cuffs with the characteristic smocking across the breast, back and upper and lower sleeves. Such smocks were worn in many parts of England, the designs of the embroidery being significant to the nature of the craft of the workmen. The design of the feather stitchery on the English farm labourer's smock on display in the Dorset County Museum consists of scrolls and diamond shapes worked in a variety of stitches, with diamond shapes being predominant in the smocking. The smock-frocks did not entirely die out of use until the latter half of the nineteenth century. The Dorset Women's Institutes are doing a great deal to revive this craft, Mrs. Horwood being a well known judge in this sphere. 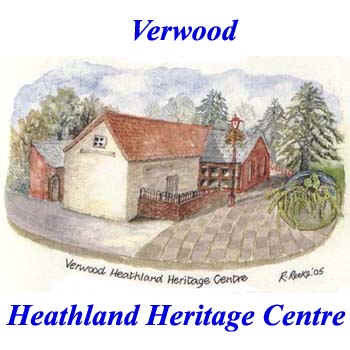 I feel that I am steadily becoming a native of Verwood and therefore Dorset, after having lived here for twenty years and I hope to be able to pass on to the "younger generation" here two of the crafts of their 'Heritage.